One of the first issues for an incoming Trinity College student is finding somewhere to live. There are a large number of rooms available for first year undergraduate students at the University residence at Trinity Hall. Trinity Hall is a large, friendly complex with its own Junior Common Room which organises many social activities and outings. 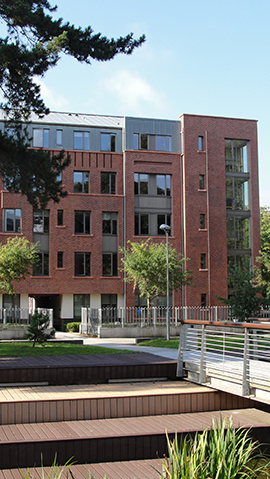 Situated 4km from the city centre, Trinity Hall accommodates over 1,000 students in shared single or twin apartments. If you are a CAO applicant hoping to come to Trinity in September, you can make a provisional application for Trinity Hall online now! Trinity Hall Open Days will take place in August. If you are thinking of applying for a room in Trinity Hall, make sure to come along to have a look at the accommodation and get a feel for the place. For those of you not looking for a room in Trinity Hall, the Students Union operate an Accommodation Advisory Service where you can find accommodation listings as well as information on how to go about signing leases and other landlord tenant information. It is located in the Students' Union Front Office in House 6 and is open from Monday to Friday 9.30am - 5.00pm. It is also open Saturdays from 9.30am to 13.30pm. The service is open to students until the middle of October. As well as free internet access and accommodation listings, the service will also provide information on setting up bank accounts, getting a PPS number, your student travel card and other necessary information to help students new to Dublin orient themselves. Even if you are hoping to get a room in Trinity Hall, please look privately as well, at least until the room allocations are announced. It is difficult to find places to rent in Dublin and the earlier you start looking, the better. For more information you can contact the Students' Union Welfare Officer and the Accommodation Advisory Service team on accommodation@tcdsu.org, by Twitter on @TCD_AAS or visit the website.